Here is my latest appearance on New Day Cleveland. Baking bread is easy- even baking with whole grains is not hard to do. One of the benefits about baking your own bread is the aroma. The house gets filled with the most wonderful smells. In this case, the experience is even better because the breads I baked are filled with herbs and shallots, so those fragrances are also in the mix. I like to make these loaves in braids and place them on a baking sheet- but they could just as easily be baked in bread pans for more traditional loaves. Great for sandwiches. I like to toast some of this bread, and use as croutons or as a base for stuffing. You can also slice the bread, brush with softened butter, then toast, for a twist on garlic bread. The garlic is already in the bread, but feel free to add more to the butter, before brushing it on the bread. In a mixing bowl combine 2 c. of flour with the rest of the ingredients and mix until smooth. Beat with electric mixer 4 minutes then add 1-cup additional flour and beat 1 minute longer. Stir in flour ½ cup at a time until soft dough forms. 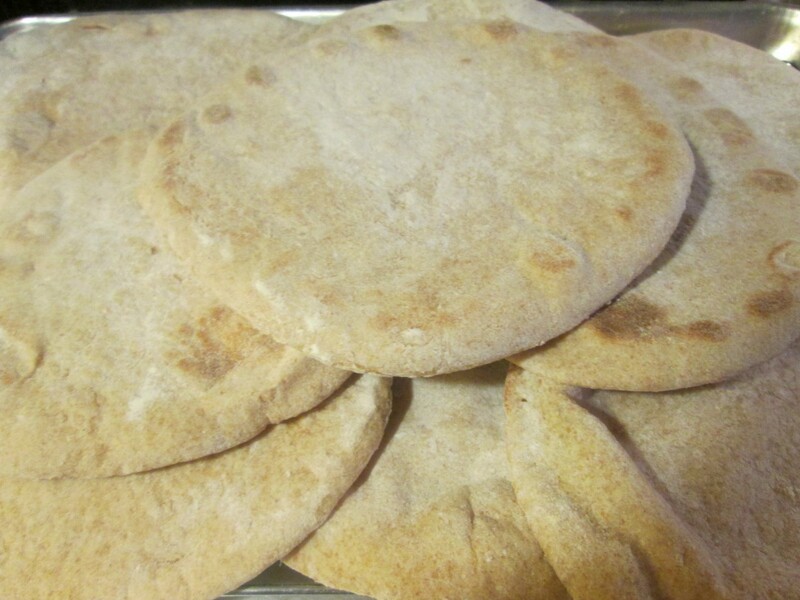 Turn onto surface and knead, adding flour gradually until dough is smooth and elastic. Place dough in lightly greased bowl and turn to cover. Cover with a towel and let rise until doubled, about 30 minutes. 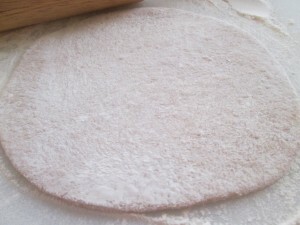 Turn dough onto surface and cut in half. Cut each half into thirds. Roll each piece of dough into an 18-inch rope. 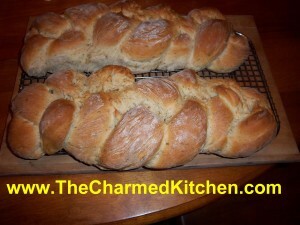 Loosely braid three ropes together and repeat with the remaining dough. Place on greased baking sheet and cover until doubled in size, about 20 minutes. Bake in a preheated 375-degree oven for 25-30 minutes, or until bread sounds hollow when tapped lightly. Makes 2. Regular yeast can be used, but rising times will be longer and water should be warm, not hot. If you are concerned about keeping away vampires this Halloween, you might want to make this recipe for cheesy garlic toast. Garlic is widely accepted as a repellent for vampires- and a lot less messy than a stake through the heart. This is one of my favorite appetizers. I make them a few times a year, but they are extra fun to serve at a Halloween party. A mixture of garlic and onions are cooked in butter, then spread over the bread slices. That would be plenty for most garlic bread- but you take it up a notch with a cheesy/ mayo mix on top. Baked for just a few minutes- these are always a hit. They can be served as an appetizer, or as a side with dinner. Slice the French baguettes diagonally into 3/4 inch slices. In a medium skillet, over medium heat, melt the butter. Combine the onions and garlic in the skillet. Cook and stir until tender. Set aside to cool. In a mixing bowl, combine the mozzarella cheese, Parmesan cheese and mayonnaise. On a cookie sheet, arrange the French bread slices in a single layer. Spread the onion and garlic mixture on the bread slices. Spread the cheese and mayonnaise mixture over the onion and garlic mixture on the bread slices. Bake in a 400 degree oven for 10 minutes or broil about 5 minutes, until the cheese is bubbly and slightly browned. Serve immediately. 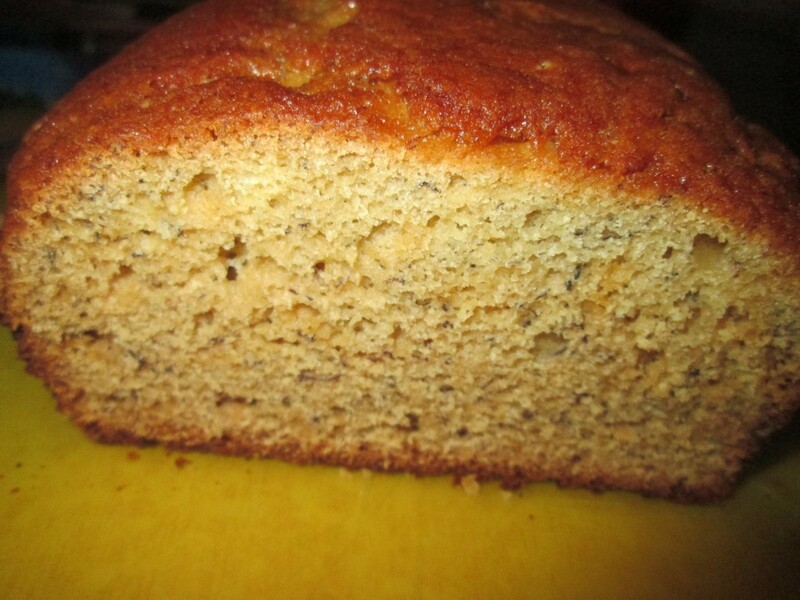 My Mom used to make this wonderful sweet bread. Made it for every family occasion. She was also a very frugal person and decided rather that toss duck skin she had removed from a duck she was using in soup she rendered the fat. Once it was cooled it looked like butter. She was making her bread and substituted the duck fat for the butter in the recipe. When my brother-in-law, Bob, tasted it he declared it was the best yet. My Mom told him what the secret ingredient was and from that day on we always called it duck fat bread- even when it was made with butter. 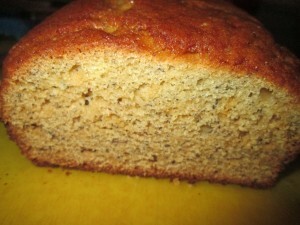 Here is the recipe- wonderful even made with plain old butter. We were having steaks on the grill and wanted some sort of a bread dish. I love garlic bread and make it a lot but decided to go all out and make this version instead. A mixture of garlic and onions are cooked in butter and then spread over the bread slices. That would be plenty for most garlic bread- but I took it up a notch with a cheesy/ mayo mix on top. Baked for just a few minutes- these were really a hit. They can also be served as an appetizer. Preheat the broiler. Slice the French baguettes diagonally into 3/4 inch slices. In a medium skillet over medium heat, melt the butter. Combine the onions and garlic in the skillet. Cook and stir until tender. Set aside to cool. In a mixing bowl, combine the mozzarella cheese, Parmesan cheese and mayonnaise. 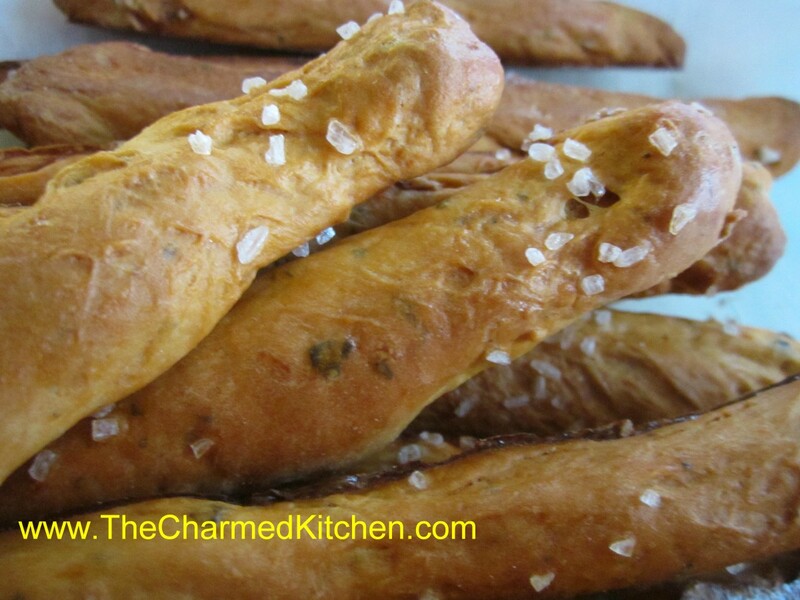 On a cookie sheet, arrange the French bread slices in a single layer. Spread the onion and garlic mixture on the bread slices. 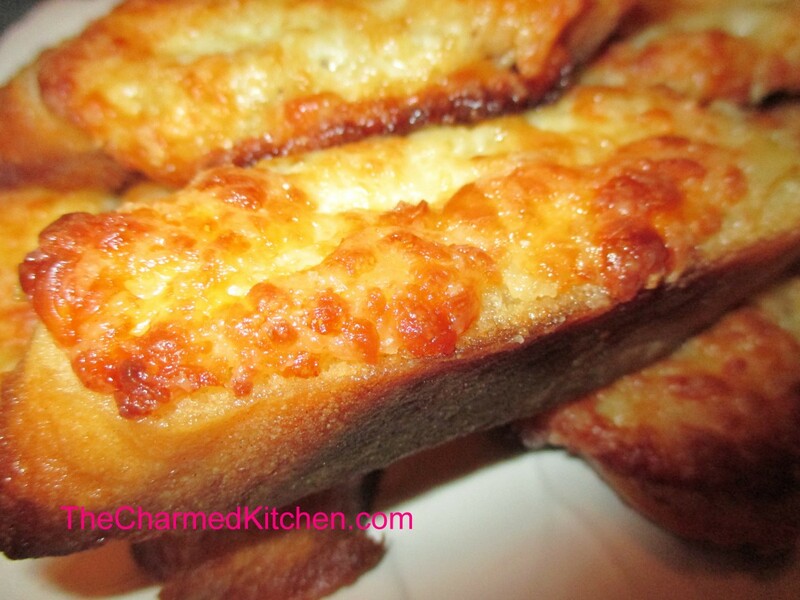 Spread the cheese and mayonnaise mixture over the onion and garlic mixture on the bread slices. Bake in a 400 degree oven for 10 minutes or broil about 5 minutes, until the cheese is bubbly and slightly browned. Serve immediately. This is one of the first breads I learned to make when I was a kid. 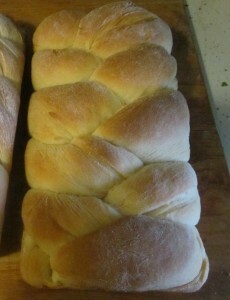 After the hundreds of other breads I have made, this is still a sentimental favorite. 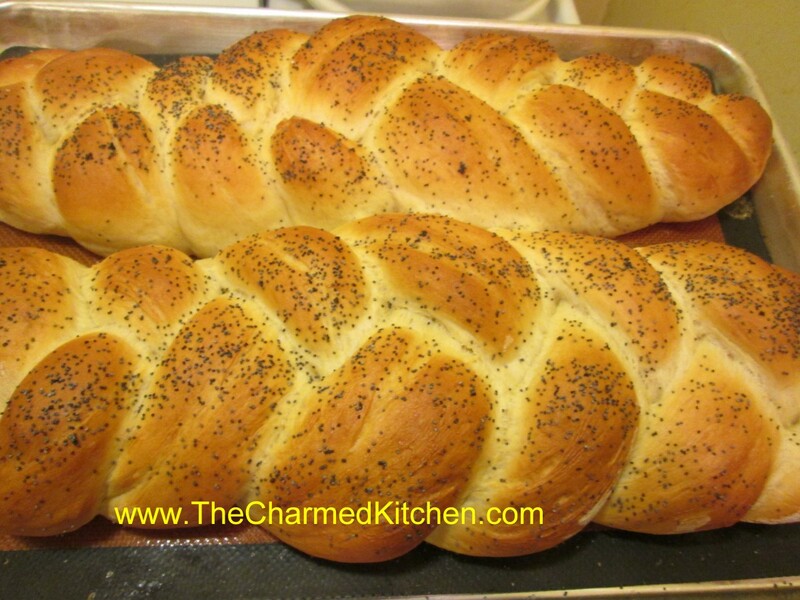 I baked the braided loaves on a baking sheet this time, but you can also bake them in 9×5 inch loaf pans. In large bowl combine hot water, salt, sugar and oil. Dissolve yeast in warm water in small bowl and add to oil/water mix. Stir in 1 cup of the flour and eggs, reserving 2 tablespoons of the eggs for later. Gradually stir in enough of the flour to make soft dough. When dough pulls away from sides of bowl remove to floured surface. Knead dough, adding flour as necessary about 8-10 minutes. Dough should be smooth and elastic. 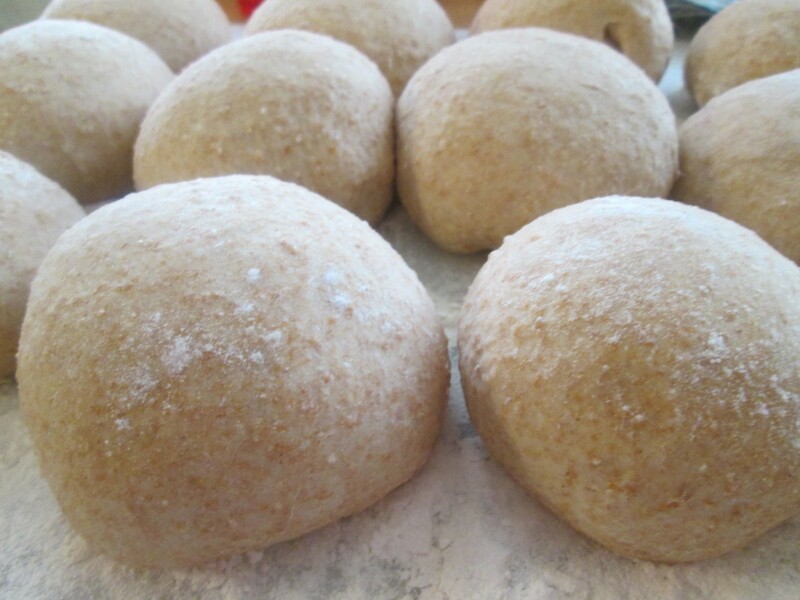 Place dough in a lightly greased bowl, turning to grease top, cover with a towel and allow to rise in a warm, draft free place until doubled, about 1 hour. Punch dough down and divide into 6 equal pieces. Roll three of the pieces into 12- inch ropes. Place on a greased baking sheet or in a greased 9×5-inch loaf pan. Repeat with remaining dough and cover. Allow to rise until doubled in bulk, about 1 hour. Preheat oven to 400 degrees. 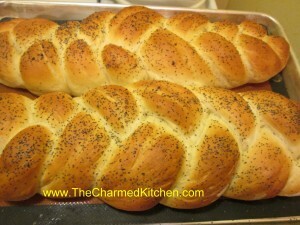 Brush loaves with reserved eggs and sprinkle with sesame or poppy seeds, if desired. Bake for 40-45 minutes in loaf pans, a little less time on baking sheets. When done, loaves will be nicely browned and sound hollow when tapped. Makes 2 loaves. Checking the freezer I found some frozen bananas so I opted to make banana bread. It’s really my favorite way to eat them, other than fresh. 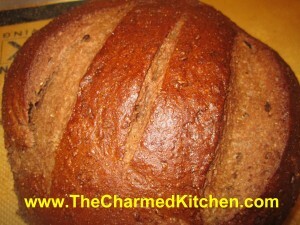 The recipe is simple and this bread freezes well so why not make a few and freeze some for later? Also a great thing to do with bananas that are overripe. Combine dry ingredients and set aside. Combine sugar with butter and beat until fluffy. Beat in eggs. Beat in eggs until mixture is smooth. Beat in flour mixture alternately with bananas. Fold in nuts, if desired. Pour batter into greased 9×5 -inch loaf pan. Bake in a preheated 350-degree oven for 60-65 minutes. Use toothpick to test for doneness. Cool in pan 10 minutes before placing on rack to cool. Store in plastic wrap to preserve moisture. Makes 1 loaf.